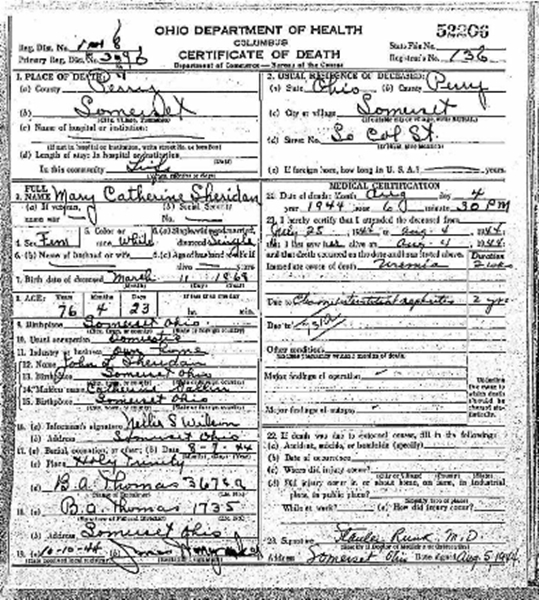 Mary Catherine Sheridan, named for her mother Catherine Gallin, and grandmother, Mary Sheridan, lived her entire life within the community of Somerset. She was born 11 March 1868 in the old Sheridan homestead. She was just two years older than Nellie, her famous younger sister, but the two sisters were more like dearest friends as they resided within the same household for their entire lives. Nellie shared her sister’s interests in politics, art, music, and was quite patriotic. It was Mary who unveiled the Sheridan statue, appeared in many of the theatrical productions along side of her sister, and who spent afternoons sitting and chatting with Nellie at the post office. She died of a chronic kidney disorder in 1944. Mary rests among the Sheridan family within Holy Trinity Cemetery, Somerset, Ohio.